Washington Street, between Columbus Avenue and Jackson Street. The original home of Sandusky’s beloved Boy with a Boot fountain was a park across from Scott’s European Hotel. 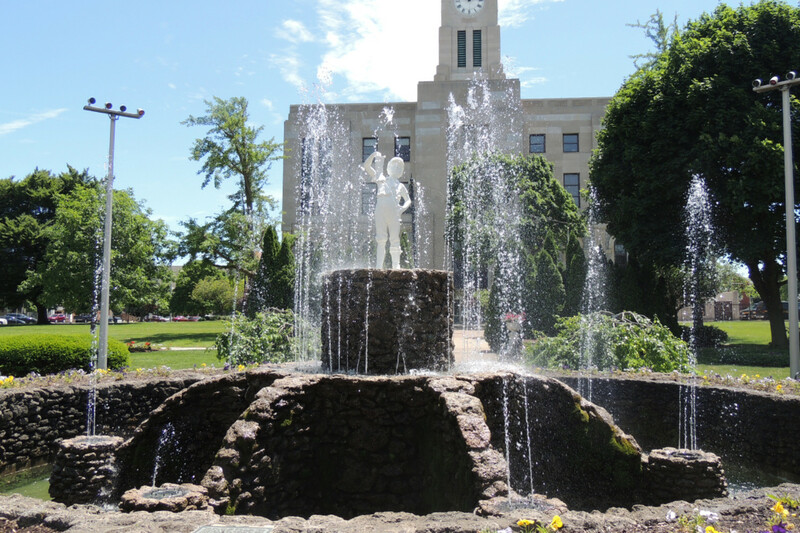 Scott purchased the fountain in 1895 and willed it to the City of Sandusky. The “Boy with the Boot” was statue cast by J. W. Fiske Ironworks in New York City and made its first appearance in Sandusky in 1895 at the foot of Wayne Street, just about two blocks northeast from here. The Hotelier Voltaire Scott purchased the beloved statue along with a few other various statues to adorn his park across from his hotel, the “Scott’s European.” His hotel sat where the CIVISTA Bank resides today. 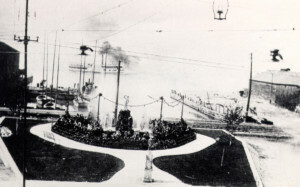 The tornado of 1924 damaged the park and the statue was housed at the city greenhouse until the 1930’s, when it was relocated during the courthouse renovations to its current site. However the statue was damaged in the early 1990’s and so a bronze replica was made in 1992, which is a part of the fountain. The “Boy with the Boot” is so loved by the citizens of Sandusky that the original is now securely housed in the City Hall adjacent to the police department. 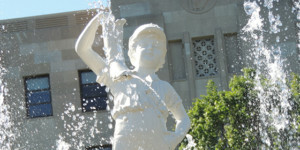 Like the Red Popcorn Wagon, the Boy With The Boot has become an iconic symbol of Sandusky and has been featured in the work of numerous local artists.